During the '70's, American Motors produced a number of very dramatically styled cars. 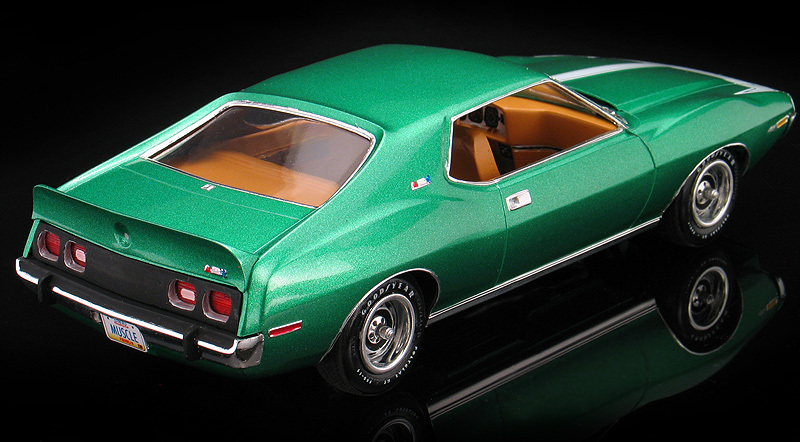 One of my favorite AMC muscle cars are the '71-74 Javelins. Using the chassis and engines first designed for the '68 Javelin, the car was redesigned for 1971. 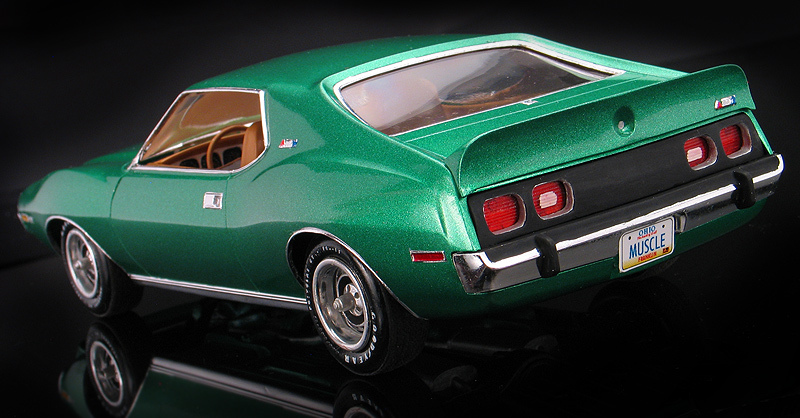 Previously, the AMX utilized a shorter wheel-base and a 2-seater configuration. The early '70's saw cars getting longer and wider and AMC followed suit when they updated the Javelin. They also did away with the smaller AMX package and made it a performance option on the Javelin. To help compensate for the bigger and heavier car AMC also upgraded the optional V-8 engine to 401 cubic inches. 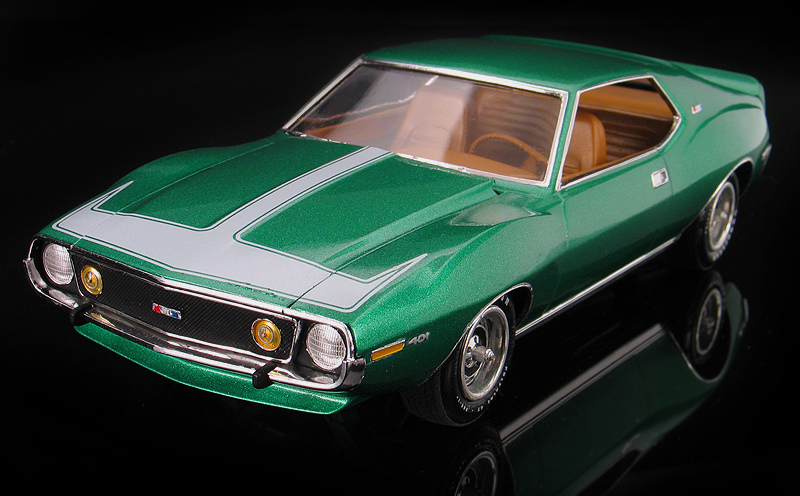 I built my replica of the '73 American Motors AMX using a mint original 1/25th scale Johan kit. 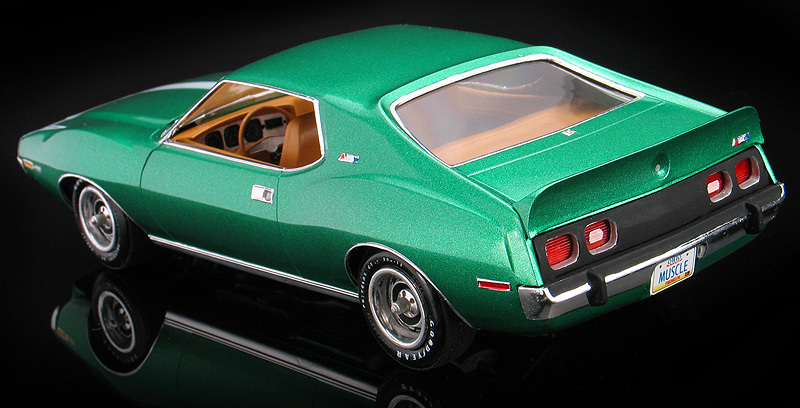 Oddly, the box art for the kit shows a '72 AMX, but the parts inside represented a '73. Unfortunately, these types of inaccuracies are typical for Johan kits as they were a smaller company and known to cut corners like updating the tooling for a kit, but not the box art. I once also got a '73 Eldorado kit inside of a '70 Eldorado box. I built my model mostly out of the box, but I did add a few changes to make it a little more accurate. The original wheels provided in the kit are the 5 spoke road wheels which date back to the '68 kit. 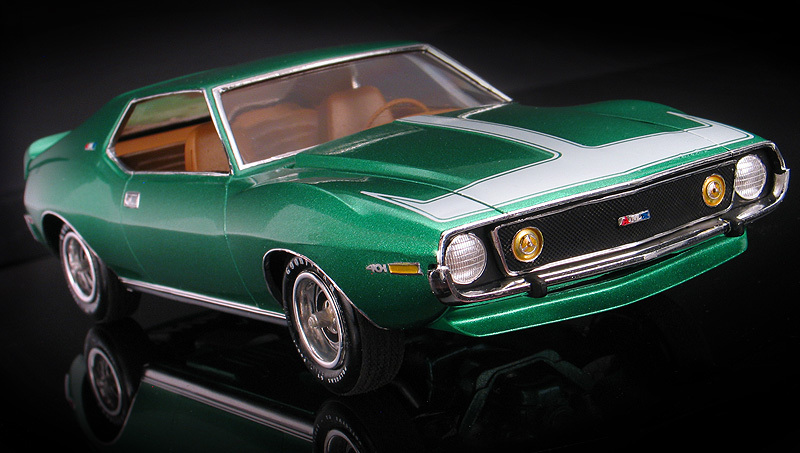 By '73 though, the AMX came standard though with AMC's "slot-styled" wheel. A pretty good representation of the wheel comes in the AMT/Ertl '76 Gremlin kit, but it needs a little work to be correct. The Gremlin wheel is molded a little too deep and doesn't look right to my eyes out of the box. I put the wheels on a lathe and cut off the trim rings. I then removed about 1/16th off the trim rings and then glued them back on the wheel. Now they have the proper depth. The paint color I chose is called "Fairway Green Poly" which was a factory color available in '73. The hood stripes were taken from a Fred Cady decal sheet.